*Updated 1/11/2015: Fixed errors and typos. I know past results do not predict future results, but I was curious today to see how the dividend aristocrats, the aristocrats who would still be classified as aristocrats 20 years ago, would perform. Yes there is survivorship bias; however, it should be noted that the stocks picked still had 25+ years of dividend increases (even if the simulation started in January 1995). I personally avoid financial institutions completely (notably banks) from my investments because I do not understand them enough. My only financial investment is in Visa, and I feel that their moat is strong enough to have such a holding in my financial-phobia portfolio. 2008-2009 saw a most severe loss from bank stocks. To include a taste of what the portfolio would look like if some % of the portfolio were in banks, we have a separate backtests on the bottom. For the # of dividend increase years in 1995, subtract 20 from these numbers. Many of these stocks such as MMM and PG still have a very large number of div increases behind them as of 1995. Note that PEP only has 42 years (so it's missing 3 years, but I left it there just because it's very similar to KO). I could of added other conservative names like GIS and XOM, but this list is strict in the sense that I must use companies on the David Fish's dividend aristocrat list that would have enough years to be aristocrats in 1995. You might have noticed that the list of stocks is already ultra conservative with a majority of the shares in consumer staples. The more volatile plays include MMM and EMR since they are industrial stocks which tend to be cyclical. The portfolio above starts with $1k in each position. 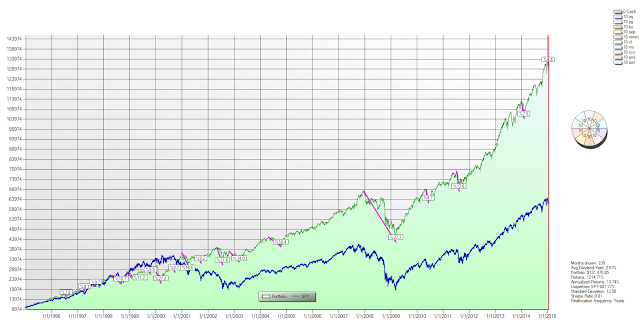 Click the thumbnail below to see the backtest graph. What is surprising from this graph is the draw down during the 2008-2009 period. This portfolio, with the majority of holdings in conservative companies, only fell by 37%. 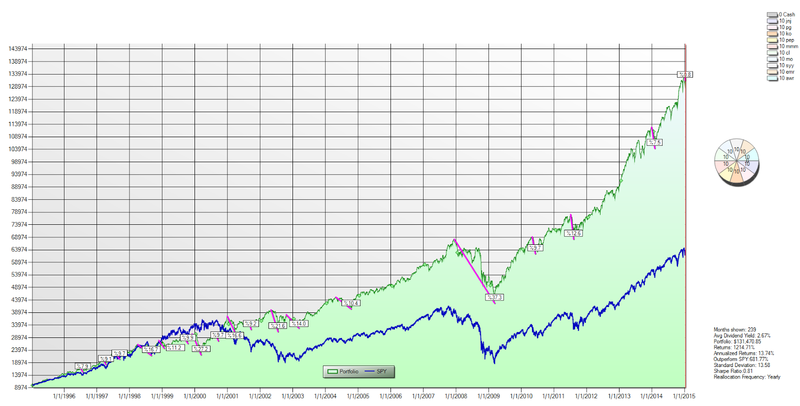 The S&P500 did not fare as well. The S&P fell around -55.2%. That is quite substantial. What is highly interesting to note here is the flight to quality during times of distress. The aristocrats are what some would classify as the highest quality at the time. Many have very high credit rating (for instance JNJ is AAA) and bulletproof balance sheets. As a result, the bluest of aristocrats had a lower draw down during the (possibly) worst financial crisis of our lifetime. Since they experienced a lower draw down, they started from a higher point when the stock market was recovering. This accounted for the much larger increase in portfolio value from the 2009-2015 period. Starting with an initial $10k in the beginning of 1995, we divide the amount evenly among the 10 stocks. Bank weightings are 10% of the portfolio here. The largest draw down is 45.6%, which is worse than the portfolio without bank stocks. This is still better than the S&P draw down of 55.2%. Additionally, the other aristocrats in the portfolio had strong foundations and held up very well. What is surprising is that in the end, the results are barely different (comparing portfolio without banks to one with 10% in banks). This shows that diversification across sectors is important. Replacing BAC with the horrid C (Citigroup), a stock that got incredibly crushed in 2008, does not change the end result in a noticeable manner. What is interesting is the large success of the other non-bank aristocrat stocks in the portfolio. They have performed extremely well from 2009-2015. Now what happens if, say, one was unfortunate enough to own even more bank stocks before the financial crisis? Increasing the bank percentage in the portfolio to 20% (using BAC, C has slightly worse results) exacerbates the draw down in 2008-2009 to 52.5%; however, the portfolio still has virtually the same value at 2015 (at around $122,000 using BAC, C is a bit lower). Even with 20% in banks, the 80% in aristocrats were strong enough to return substantial returns. The annual returns are 13.33% in this worst case test. Granted, the portfolio contains one super-performer. It deserves to be mentioned. That is MO. The stock has been invincible for many many decades. This was included in the portfolio because there will always be that one surprising performer in one's portfolio. MO happened to work wonderfully in the past. Today MO has spun off PM, KRFT, and MDLZ. Those who bought MO would be very well off today. There are many growth stocks today that may mimic such spectacular returns. Perhaps SBUX becomes the next MCD? Or perhaps Visa continues its spectacular dividend and capital growth. 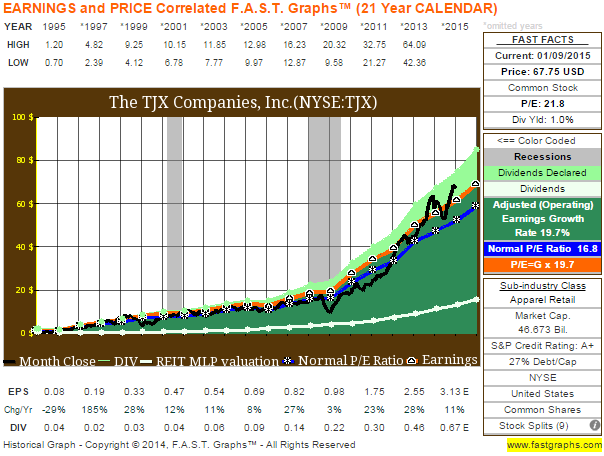 Or will ROST and TJX be able to continue their impressive growth? Will CHD continue its massive earnings growth over the last decades+? Only the future will tell. In the end, this backtest is only an academic exercise and does not foretell the future. It does indicate that the strong often get stronger, and that buying quality (financially sound companies with strong moats) is very important. During tough times such as the 2008-2009 depression, the flight to quality is quite real. The aristocrats experienced a softer drop compared to the general market. *Note: The reader must take all data here with a grain of salt. The backtest software used was EZBacktest. Any errors would be related to how the software utilizes old stock data. Great work! 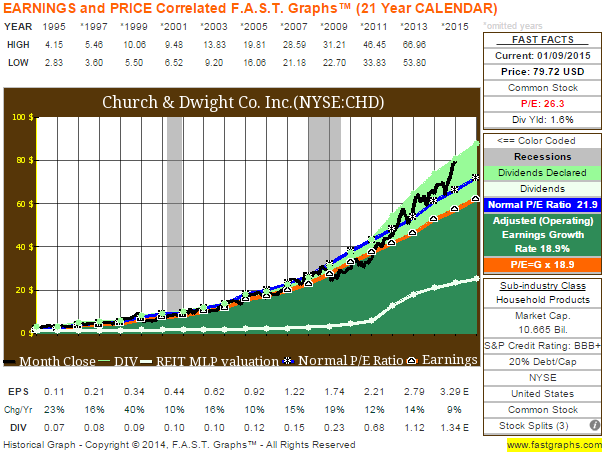 This really shows the strength in dividend investing and how they are able to outperform the broader markets. It's one thing to read about it but to see the difference in chart form is really striking. Thanks for the post. It is good that we have an investment methodology and stick to it. I think an important point that wasn't mentioned was the fact that these aristocrats kept paaying increasing quarterly divs even when their share prices were falling. Talk about reducing stress.